Barcelona president Josep Maria Bartomeu has confirmed that the club did indeed ask their soon-to-be player Frenkie de Jong to eliminate longstanding rivals Real Madrid from the Champions League. Los Blancos capped off a horrendous week by succumbing to their third consecutive defeat when they crashed out of the Champions League courtesy a 4-1 loss to Ajax. The Spanish giants went into the game with the ultimate advantage as they had earned a 2-1 first leg lead over the Dutch side. However, the team failed to keep up with the young and spontaneous showing of the visitors and were completely outplayed on the night. 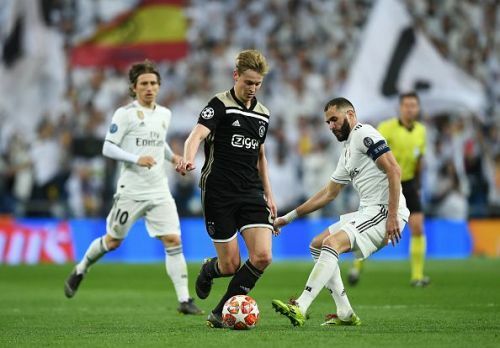 After the incredible comeback, outgoing Ajax star Frenkie de Jong, revealed that Bartomeu had met with him and told him that his current side should knock Real Madrid out of Europe's top competition. The youngster told Dutch newspaper De Telegraaf (via Goal) "I spoke to them when I signed the contract and they told me to try to knock out Real Madrid, as that would be great for Barca too." Bartomeu has now confirmed that he did tell de Jong that one of his objectives should be to bring down Real Madrid. Speaking to Cadena SER, he said, "I talked to his representative, he put on and I congratulated him. I told him that one of the objectives he had was to win against Real Madrid." The club president also spoke about Messi's contract stating that "his will is to renew it once again before finishing the mandate (2021)." Barcelona currently sit seven points clear at the top of the table in LaLiga and would hope to extend that lead when they face Rayo Vallecano tomorrow night. As for de Jong, he will be hoping Ajax can take out a few more top sides in the Champions League in the coming months.